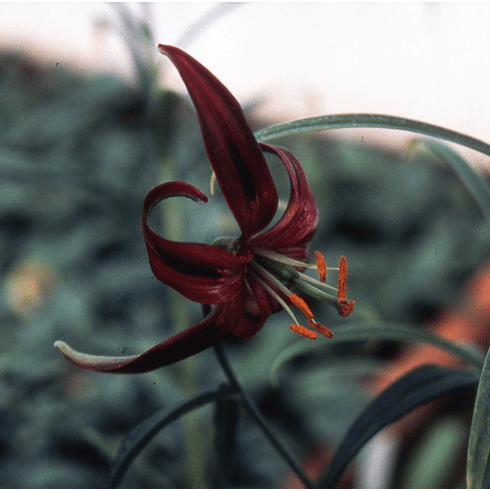 Found growing in the limestone soils of the mountainous Yunnan, Lilium papilliferum is as uniquely colored as it is difficult to cultivate. The small, dark purple, reflexed flowers are borne atop 2 foot stems. On one of many visits to the old Oregon Bulb Farm, we were greeted by an almost giddy Ed McRae who could not wait to show us this single bloom. The timing of our arrival was perfect as this flower was in its prime. As can be seen on close inspection, Ed had pollinated his prize with its own pollen, hoping it would self fertile. This was the only bloom for the season. Seed for this species, if it can be found, is immediate epigeal in germination. It requires a well drained but moist soil in the late rather than the early spring like most species. Insert photo is of the 'Red Admiral' Butterfly (Vanessa atalanta) feeding on 'L. papilliferum'. Photo by and copyright Richard Hyde of the United Kindgom, all rights reserved. Used with permission.